Adult braces have never been so popular. If you have crooked teeth and want to avoid destructive crowns and veneers then adult braces are for you! Adult braces can straighten teeth in as little as 6 weeks! They can quickly and sometimes invisibly transform a smile. Adult braces can range from truly invisible (lingual braces) to barely visible tooth coloured brackets. Below are some of the techniques that can successfully transform your natural smile into a naturally straight smile! Revolutionary new Fastbraces are innovative orthodontic braces, specially designed to move teeth fast and efficiently with gentle forces giving beautiful straight teeth safely in as little as a few months with little or no discomfort. Invisalign is a discreet system of clear aligners used to straighten teeth. The treatment consists of wearing a series of nearly invisible Invisalign aligners that you change every two weeks for the next set of aligners. Six Month Smiles® is a variation on tried and tested fixed orthodontics. Six Month Smiles braces are tooth coloured helping to create a barely visible brace system that can move and straighten the teeth quickly and efficiently, sometime in as little as 3 months! Visit the 6monthsmiles website for more information. Lingual braces are the truly invisible way to straighten teeth, providing the perfect cosmetic alternative to conventional braces that are often bulky and aesthetically displeasing. 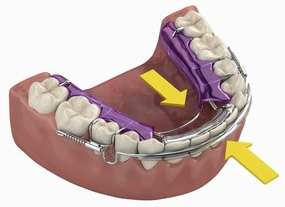 STB light lingual braces work faster than conventional braces and other straightening methods. Results can take mere weeks or months. While a standard brace can take more than two years to create the perfect smile, the new spring-loaded device takes on average between four and 16 weeks to nudge teeth back where they belong.